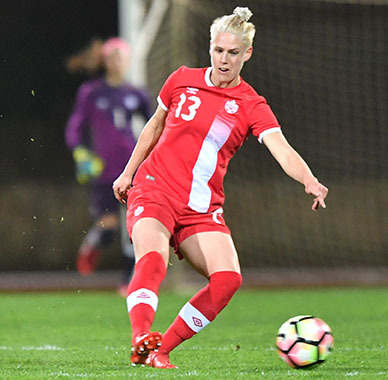 Canadian women’s national soccer team veteran Sophie Schmidt won’t hit the big 3-0 in age until late June, but she has packed a lot into her first three decades. Three World Cups. Three Olympics. Two Olympic bronze medals. Numerous international qualifying tournaments. And it all started with backyard scrimmages with her two brothers and then minor soccer in her hometown of Abbotsford. Sophie Schmidt at the Algarve Cup in 2018. Photo: Mirko Kappes, Canada Soccer. Schmidt started out playing youth soccer in Abbotsford and graduated from WJ Mouat Secondary. She has been a member of the Canadian women’s national team since 2005, and part of the national youth system since 2003, when she was just 15. She was the fourth national women’s soccer team player to achieve the milestone of 150 appearances for Canada, and has now played 169 times for her country. In 2012, Canadians were thrilled when the women’s national soccer team earned Canada’s first team medal at the Olympics since 1936 by Photo:taking the bronze in London. The team repeated the result in 2016, winning the bronze medal at the Rio Summer Olympic Games in Brazil. Schmidt played a key role in both these Olympic tournaments. She scored the only goal in the quarterfinal match against heavily favoured France to send the Canadians into the semifinal in Rio with a 1-0 victory. A defensive midfielder, she doesn’t score as much as the forwards do, but has still accumulated 18 goals and 16 assists for Canada. When not representing Canada on the national stage, Sophie earns her living by playing professionally, most recently for FFC Frankfurt in the elite Women’s Bundesliga in Germany. She earlier played for several professional teams in North America, and attended university and played soccer at the University of Portland in Oregon, where she earned her bachelor’s degree in life sciences and German. Sophie Schmidt at Algarve Cup, 2018. Photo: Canada Soccer/ Mirko Kappes. 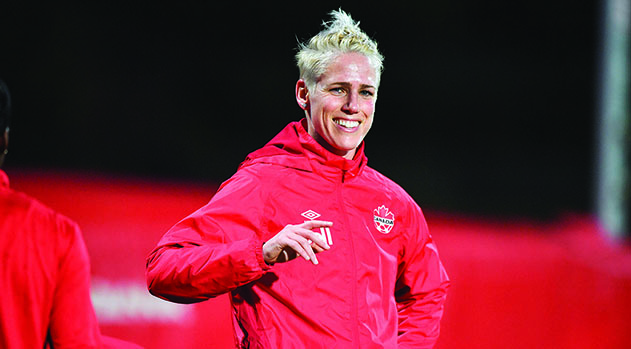 She started with the Canadian women’s team in 2005 after playing with its youth teams. She was there for some of the lows, such as placing last at the World Cup in 2011. And she was there for the highs, when John Herdman joined the team as head coach and led them to Olympic bronze in both 2012 and 2016. Another career highlight was in 2015, when she got to play against hometown crowds in Vancouver, as well as in other Canadian cities during the World Cup. There’s at least one more big goal on the horizon for Schmidt. She and the rest of the Canadian women’s national team hope to qualify for and be competitive in the World Cup in France in 2019. Canada is currently fourth in FIFA women’s soccer rankings. Living the life of a professional athlete means Schmidt does not get home to Abbotsford very often, but when she does she stays connected to youth soccer, working and volunteering with the local association. Although she can’t be at UFV in person for Convocation, she sends her regards to her home community. Her family will be big support for her next big live event too. She and fiancé Nic Kyle plan to marry in December.